Brand New Look. Re-coat Curtain Wall Sections..
Home » Our Services » Brand New Look. Re-coat Curtain Wall Sections. Construction is an expensive business, so anything that reduces the need to replace architectural elements in a building is a good investment. Unfortunately, any metal within a property can corrode, if it is not protected from the environment. However, if metal is in good condition and sealed with a good quality coating that remains intact, it will prevent damp from permeating the structure. Curtain walling frames may have been powder coated when they were manufactured or after they were first installed, but this layer inevitably fails over time and if the underlying surface is exposed to the elements, the substrate can deteriorate. If the curtain walling framework degenerates too much then it will lose its supporting strength which can be dangerous. 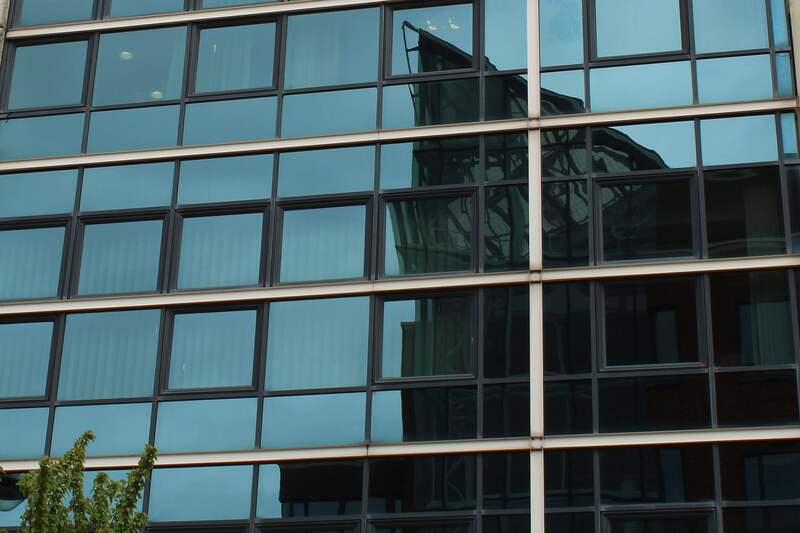 Corrosion can be repaired by our teams and our estimators will be able to assess what needs to be done when it comes to restoring curtain walling. It may just be a case of some filling before preparing then recoating or if the metalwork is in very good condition then the straightforward stages of re-spraying curtain walling can be followed without repair work beforehand. There is a sophisticated range of anti-corrosive coatings available for curtain walling in order to stop damp from seeping in. Some are designed to withstand ultra violet light and changes in temperature and a huge range of colours can be used. At Vanda Coatings we can match any RAL or BS colour, so if you want to update the image of your company, we can help. If you are a property owner trying to sell or rent out a property, a stylish looking exterior is much more likely to entice buyers or tenants. You may be a new occupant wanting to re-brand. Whatever the aims for your commercial building, curtain walling can be recoated quickly and easily be our teams without disrupting the business inside the building. The resulting finish will make curtain walling look like new and the substrate will be protected for years to come. How does Vanda Coatings Spray Paint Curtain Walling? Curtain walling usually covers a large expanse of a commercial building, so it is sometimes best to divide it up into sections and complete one section at a time. This entails good organisational skills and our team leaders are experienced in working on very large projects whilst liaising with project managers and all other trades. Whether a section is re-sprayed one at a time or a whole façade is prepared before the final coating is applied, the order or work is usually the same. Preparation is an extremely important part of any recoating process. The original coating on the metal framework will need to be rubbed down first of all until the substrate is completely flat. Abrading has the added advantage of keying the surface, so that the next layer stays on. The amount of abrading depends on how the framework was originally treated and the condition it is in. The aluminium frame of the curtain walling may have been anodised which creates an extremely hard finish and will take more time to sand it down than other treatments. If the paint is in bad condition then this will also affect the abrading time. Our Vanda operatives will take the time to prepare the metal thoroughly in order to prevent premature paint failure. The edges of flaky paint will be feathered out, so the surface is level ready for the subsequent coatings to be spray applied. After any grime and dust resulting from the sanding down and feathering has been cleaned off, the glass panels and surrounds including brickwork are masked up to prevent overspray from getting on to them. Bond coat and or primer will then be spray applied to the curtain walling and once this has dried, the final specialist top coats will be sprayed on. When spray applying paint the method used could be electrostatic or HVLP depending on the size and type of the curtain walling as well as the clients’ preference. Painting curtain walling and the necessary preparation means our operatives have to work at height and all the Vanda employees are highly experienced in these types of projects. A façade may need to be scaffolded out and every Vanda operative has an IPAF and PASMA certificate, so they are able to use MEWPs and towers to reach all the high metalwork. All our employees have CSCS cards to and are experienced in working safely on all types of sites.